Are you a client at or have you visited the host studio you want to complete your training in? Have you reviewed the website dedicated to our teacher training program? Have you submitted an application? Which cycle of training are you interested in? Which location are you interested in completing your training at? What should I know about Assessment sessions? Assessment sessions are booked in as regular private sessions in MBO, with a note that says "RPTT Assessment". When they book the session, we will have their billing information saved so you can check them out the day-of. How much is an assessment session? The cost of a regular private session, $110. Please check them out using the pricing option RPTT Assessment Session. There is an RPTT assessment form shared with the front desk, you can search for it in the Google Drive. If you see a private session with the words 'RPTT Assessment' in the notes field, simply print a form place it on a clipboard with a pen, and hand it all to the instructor before the sessions starts. NOTE: All apprentices, upon the first weekend for the course, will have a purple Membership symbol next to their name in MindBody. *Apprentices must still pay in full for semi privates and group classes prior to their course start date. To sign apprentices in: Select Workshops. 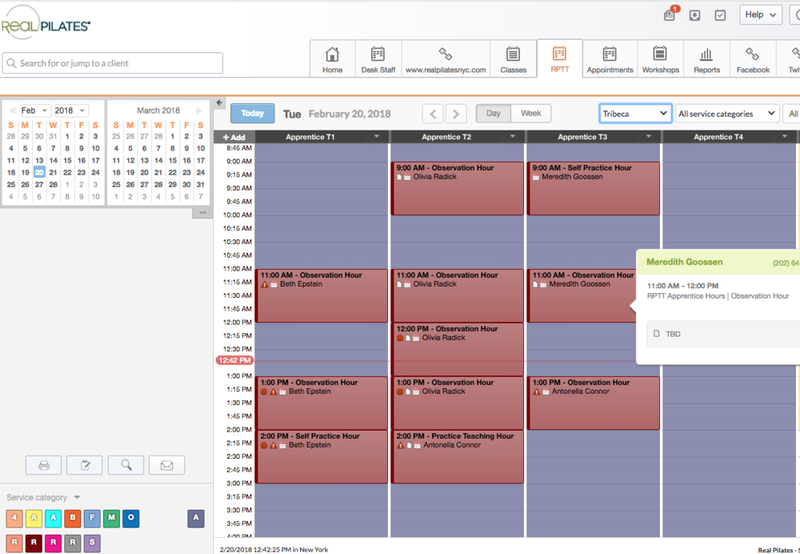 Select View Roster under the training dates. Click on the current date at the top right hand of the chart to sign apprentices in to the seminars. You may be asked to reach out to clients to find "test bodies" during the weekend seminar apprentice drills. We have a list of clients we contact regularly, here. If you are scheduled to work in Soho during weekend seminars, you may need to coordinate with the lead trainers and incoming instructors/clients to let them know where the training group will be during their sessions, in order to facilitate order and keep them from working too close to one another. When the regular sessions are done for the day, you can leave. Our lead trainers are equipped and ready to close the studio as needed. You do not need to stay until the end of the seminar. Apprentices begin taking two (2) private and/or semi private sessions per week the Monday after their program begins. Their session packages are already added onto their accounts, as well as their RPTT hourly requirement and test out packages as shown below. NOTE: The amounts shown under the Remaining column on the right hand side shows the number of hours apprentices have left to complete of their packages. Semi Private sessions are sometimes difficult to book, with everyone's fluctuating schedules. Apprentices should be informed (before the 24 hour cancelation window) if they are the only one booked into a semi private session so that they can find a workout partner, change it to a private, or reschedule as needed. WHAT IF AN APPRENTICE RUNS OUT OF THEIR COMBO PACKAGE SESSIONS? 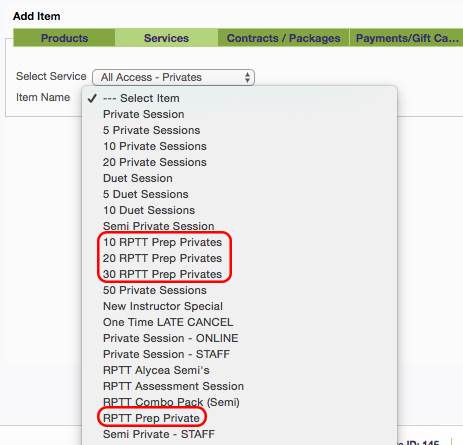 If an apprentice is signed up for a private or semi private session but no longer have sessions remaining in their combo package, they must pay for the session at the RPTT Prep/Post rate. The apprentices are required to fill out an observation sheet for each hour they observe. The observation sheets are kept in a designated folder at the front desk, one for the Beginner system - Phase I, one for the Intermediate system - Phase II, and one for the Advanced system - Phase III. They will know what phase they need! If they run out of sheets, they will ask you to print more. The apprentices hand in their spreadsheets, the completed copies go into a separate designated folder. WHAT IS THE PROTOCOL FOR THESE OBSERVATION SHEETS? Please keep printing sheets as you have been for apprentices. They will know which "phase" of observation sheets they need and you can find them by searching on the Google Drive. Once the Observation Sheets are filled out by the apprentices, they will turn them into the desk (YOU!) and you can place them in designated folders at each location. I will pick these sheets up periodically and transfer them to Soho. Once in Soho, the sheets need to be scanned into the Google Drive, in the folder labelled "Observation Sheets" RIGHT AWAY. This is for those of you who work desk in Soho. Please make this part of your daily on-going tasks. If we keep up on this each shift, they won't stack up and it'll be easy-breezy. Terriell will sort the digital copies and share them with teachers - all you gotta do is scan and save. When the completed sheets have been scanned into the Google Drive Folder, Sort the sheets by TRAINEE NAME, and place them in the folder at in the Soho Desk filing cabinet labelled "SCANNED and COMPLETED OBSERVATION SHEETS SORTED BY TRAINEE"
From there, they will be given back to the trainee's before they test out. Apprentices are required to take three (3) self practice hours per week. They are booked in MBO by the apprentice, you simply have to sign them in. Apprentices are required to teach between 5-6 hours per week during the program. For the first 6-8 weeks the apprentices teach for free, their friends, family, etc. All incoming new clients must fill out a liability form. HOW DO I SCHEDULE AN APPRENTICE? Under the RPTT tab you can book an observation, self practice, and practice teaching session. You book and check them out under the name of the apprentice, as you would a client. The sessions appear as red. WHAT IF AN APPRENTICE RUNS OUT OF THEIR APPRENTICE HOURS (OBSERVATION,SELF PRACTICE, PRACTICE TEACHING)? If an apprentice is signed up for their required apprentice hours but no longer have hours to apply to their booking, please notify the apprentice so that they can book hours they need. They may still choose to complete extra hours which is normal! They have a designated amount of flex hours they use to round out the program. You may simply leave the session un checked out, they track their official hours on a separate Google sheet. We want them to continue to book on MindBody, so the front desk knows when they will be in the studio. Between week 8-10 the apprentices become eligible to teach paying clients, Johnny will enter their apprentice teaching schedules into MBO, a block of time for privates and one Real Deal $10 group class. The apprentice sessions begin at $35/session, once the apprentices reach 400+ hours in the program, their rates increase to $50/session. WHAT SHOULD I EXPECT DURING APPRENTICE TEST OUTS? Apprentices are required to test out at the Beginner level after Intermediate I seminars, at the Intermediate level after the Advanced seminars, and final testing takes place after all of their required hours are completed. The front desk can be asked to reach out to clients to ask them to volunteer as test bodies, and/or send reminders for upcoming test outs once clients are confirmed. Test outs are entered into MBO, and should be checked out accordingly. GRADUATE RATE FOR PRIVATE SESSIONS? We do not have a current graduate package rate. If an apprentice is hired by Real Pilates, and has been added to the schedule, they are eligible for the staff rate for sessions. WHAT IS THE DEAL WITH WORKHSOPS? If an instructor is not scheduled on that day, but is teaching a workshop, the workshop will not show up on the appointment schedule. It will only appear in the Workshop tab. If, for example, an instructor is teaching in TriBeCa in the morning and in Soho in the afternoon the workshop will appear in both locations. This is the same as with classes. When we have a RP Teacher Training seminar at a host studio, not taught by one of our instructors, it is booked under TBA Soho. Inside appointments, it will look like it is happening in Soho but it is actually offsite. The easiest way to double check any information you want about a workshop, or to sign-up someone I recommend going through the Workshop tab. This will be the most accurate. WHY IS THERE A PRICE DIFFERENCE FOR CECS VERSUS NO CECS? RPTT Graduates are required to complete a specific number of Continuing Education Credits (CEC's) to maintain their active status. The workshops we offer that include PMA or RP CEC's have a separate price for those. If an instructor is signing up for the workshop, simply ask if they want CEC's and check them out using the appropriate pricing option!